Let’s face it, we don’t live in a perfect world. We work hard for what we have and we invest in our property, until the day arrives when we wish there were such a thing as Vandal-proof Wall Caps. Precast Concrete Wall Caps provide great protection for a wall- the top surface of a wall is usually the most exposed surface of a structure and our climate in the British Isles is non too clement. Wall caps shelter the top surface and with their integrated drip channel they shed rain water away from the wall face. But standard wall caps are not vandal-proof. 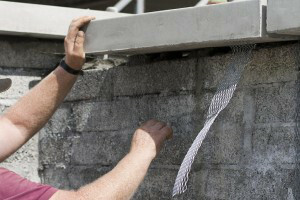 Its an unfortunate fact of life that there are those who enjoy nothing better than to up-end and destroy what others have worked so hard to build and a favourite target for the destructive energies of the vandal is the wall capping you installed to protect and add a touch of style to your boundary wall. The answer is vandal-proof wall caps. At Killeshal we manufacture two types of vandal proof wall caps- one to suit walls with a rendered finish and one to suit unflustered walls such as red-brick walls. The first type features an integrated expanded metal mesh which is laid flat against the wall face before rendering and the render coat is applied over the mesh. This will give a surprisingly strong bond between cap and wall and will make it very difficult to unseat the wall caps. The second type features notches which are aligned to pins inserted into the top of the wall. When the caps are then laid down onto the wall-top they will be secured in place by the pins. Contact Killeshal to see how our vandal-proof wall caps can benefit your property.